In case you haven't noticed, it's Christmas. What does that mean? Christmas parties! I've been roped into several of them, and while I like seeing my friends, I'd much rather talk with them during a ski, a hike, or anything other than the forced small talk of a party. I want to be doing something, not just sitting around. Am I the only one whose heart sinks with a party invite, feeling grateful to be included, but sort of dreading it? I hope not. Far better, for me, is the outdoors adventure. I feel like conversations are much more real there. I've thought it before: in the wilderness, I am the closest to the best person I can be. The day before Christmas Eve, we went skiing on a trail that is usually off limits for me. Packed with steep dropoffs and climbs, it is less about gliding than survival. But sometimes, the stars align, as they did that day, with a deep dump of fresh powder, slowing me down enough that I could enjoy the ride. The temperature barely scraped into double digits, and the dogs swam through the snow, almost as deep as they were. It was perfect. On a day like that, you can talk about anything. 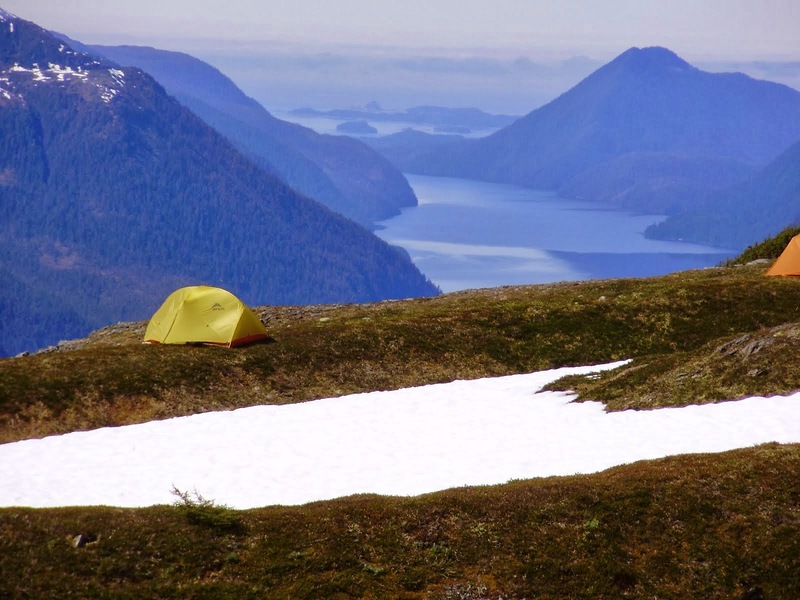 I thought about the people I have confided in over a camp stove, or between tents. The people I met who briefly shared my life, people whom I probably had almost zero in common besides the wilderness. People who have become lifelong friends because I swung a tool beside them on a trail, or because we shared an experience together that changed us forever. For example, Jack and me huddling in a lightning bracketed forest, sure our time was up. Steve and me burning out a safety zone as a fire rushed toward us. And the more benign: stars brushing the tops of aspen trees, sky stained pink from northern lights in an Idaho sky. The wilderness for me is almost all that matters, although that's not really true. There's family, and friends, and doing good in the world. But if there's no wilderness, for me there's no knowing anyone. Seeing how someone reacts to adversity or compromising tells you a lot. There was the former boyfriend who showed impatience when my Raynaud's afflicted fingers refused to work. And the other one who skied ahead of us in minus twenty temperatures, while a friend stayed back with me as I towed the sled with our gear. There was the woman who pitched a fit when I suggested we hike just a little farther rather than sitting in our tents at two pm in the rain. And the good ones: Flash, who talked me through a major bonk and lack of campsites after a long, downhill hike. Beekeeper, who stuck with it on a blazing hot, 22 mile day despite overheating. I have not always shown bravery in the wilderness. I have whined, I have had meltdowns. It is a work in progress, always. But way more real than party talk. Happy holidays, friends. I wish for you a perfect day, whether it's a hike through the forest, a ski in an icebox winter, or even a party. See you in the new year. In winter, the small enclave of houses near Wallowa Lake becomes nearly a ghost town. Most of the cabins are summer rentals, shut up tight. A few snow-shrouded cars hint at reclusive year-round residents. The gondola stopped running months ago. The shops are closed. You drive through, feeling as if you are the only person in the world. The trails in summer are full of horses and hikers, a place to generally hurry through enroute to a high mountain lake. But in winter, you can have them all to yourself. I was looking for a trail a short drive from the house, and this one, only six miles from home, was perfect. I could say I am fortunate to live so close to mountain trails, but it's not really a stroke of luck, not an accident of fate. I took additional science college classes at night for two years to supplement my BA in order to qualify for the job I now have. I lived in places that were not geographically desirable for years, lonely places, building up my resume. So while I know fortunate events in life have led me here, much of it was my doing. I often wonder if dogs feel sorry for us as we plod along slowly on two feet. Ruby and I headed up the East Fork Wallowa trail, which in summer is a rock-studded slog until you reach the alpine shores of Aneroid Lake. The forest is unhealthy here, with little sunlight reaching through the thick mat of trees. It's not particularly lovely; you don't get views for at least three miles. But in winter, a thick coat of forgiving snow turns it somewhat magical. I followed someone's Yak Traks toward the dam that feeds the small hydropower plant for the resort houses. That person had turned around and accessed the dam road to return to the trailhead, a steeper and shorter option that also avoids some avalanche paths. Because there has been little snow until now, the avy danger is low, although it won't be soon. Light snow has begun to cover the surface hoar, and hikers will have to beware the danger. Ruby patiently waits for me to appear. In a couple of miles, too soon, we arrived at the dam and little cabin. I've never seen anyone at this cabin, and I think it's for Fish and Game workers. If it were mine, I would be here all the time. Is there anything better than a small cabin in falling snow? The water backs up by the dam to create a small lake. It doesn't freeze because of the force of the river running into it. Ruby didn't want to turn around. If it were up to her, we would walk forever. But there were things to do in town. Make bread, pack for a trip, send a copy of my book to Fresh Air (because you might as well aim high). As we headed down the trail, I encountered a solo female hiker, and then later, two women carrying snowshoes. That was it. There were no men in sight. The women knew the secrets of winter trails, too. But, I don't want to turn around. 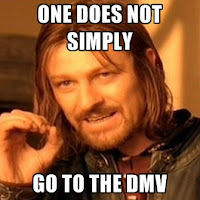 You know it hasn't been a stellar week if going to the DMV is the highlight. But wait, maybe it is. Because this is the first time I have lived in one place long enough to renew my driver's license! As a seasonal worker, I kept the license from my home state for years, so I guess that could count. But it didn't, not really, because I was living in Nevada/Washington/New Mexico/Idaho/California; the venue changed with the seasons. Since then I've had licenses from three states, but I never stayed there long enough to have to renew. In fact, I never wanted to stay in one place that long. The horror! Wasn't it better to keep on the move, seeing new places? I thought this way for years. I recently went back to one of my favorite places for a book signing--the Sawtooth Mountains. I would have stayed here forever if there had been a long term job here. Once, as I left yet another place, one of the maintenance guys said, "I hope you find what you're looking for." At the time, twenty-two and a long road ahead, I thought he was just envious. Stuck in a small town, a town he had always lived in, what could he know of the possibilities of the open road? Now, from the vantage of many more years lived, I realize I was looking for something, something intangible, something I'm still not sure I've found. But maybe I have found good enough. I went for a run a couple of days ago. My running has been cut way back as I work on the strengthening exercises that are supposed to help my knees and hopefully address the clunking I feel in one of them. But I needed to run. I'd just run a short distance, I thought. But I didn't feel like it, not very much. We have been encased in a thick, freezing fog that isn't much fun to be out in. You have to slip and slide through snow. I sighed and donned my spikes. It's actually better for me to run on flatter surfaces and we have few of those. The small park it would be. At the last minute I decided to take my camera. I don't usually run with one, because you know, I run. But daylight was fading and I thought I could endure the monotony of retracing my steps over the same miles by taking some pictures. Haphazardly I aimed my point and shoot camera at some flocked trees. Days later when I looked at the pictures I saw that they captured what I didn't see: a strange and beautiful world of darkness and fog. I kind of like them. I couldn't stay long: I didn't have a headlamp and the last part of the run is on the road. As I headed down the last switchback, I passed Joe with his mutt, headed back in. Joe pushes the darkness, always, and I laughed to myself because I know that. There's all sorts of things you learn, living in one place for a long time. Like, just maybe, this is as good as it gets. I don't regret my seasonal migrations, even as I see more settled friends be able to retire at a young age, even as I realize far-flung friends aren't really friends anymore, casualties of distance. Moving every six months for eleven years was the best gift of adventure. I wouldn't want to be in that life anymore, but I'm glad I had it. Those were my glory days, but I don't mean that everything is downhill from now on. Just different. By the way, I approached the DMV with fear and loathing. I recalled when I had to go in Alaska to get a new state license. It took forever, and the DMV lady was famous for her efficiency and lack of smiling (we used to try to get her to smile. It never worked). More than one person slunk away near tears after being chastised for not having the right forms. Here, though, I was in and out in about ten minutes, with a nice picture! I can live with that for the next several years. I was feeling a little discouraged. What was up with this patella, it didn't seem to be tracking. And after acupuncture, the IT band issue seemed to go away, but now I had a weird tendinitis thing near the ankle. Was my body just wanting to stop? I couldn't accept that. To top things off, a dense fog had moved into the valley, keeping a lid on us and dropping temperatures to single digits. This was hard to take. However, the rumor was that if you drove above it, a springlike 50 degrees could be found, along with sun. It was time for a test--both of my fitness and of the rumored warmth. I settled on one of the hardest winter slogs around here that still would allow me to get home at a reasonable hour. The hike up the backside of Mount Howard is no easy undertaking. While you do follow a closed road, the grades are terrifyingly steep, depositing you finally at 8,000 feet. As sprightly as your hiking pace may be, I guarantee it will be reduced to a slog before long. Can you tell the typical wind direction? A strange lack of snow allowed me to drive to the summer trailhead, reducing the trek by a couple of miles. I would take whatever advantage I could get. I was also delighted to find that the tram company had driven up the road recently in a snow cat, so the overall slogginess was reduced significantly. Was this cheating? No, I thought, as I sunk deep in interesting surface crystals (this is formed when water vapor from the snowpack moves to the surface. Very dangerous on slopes when it gets buried as far as avalanches are concerned). My attempt to capture surface hoar--not very successful, but trust me, it's like jagged pieces of glass. Despite the snow cat advantage, my pace was reduced to a slow shuffle. I was down to one layer as I crept skyward. Animals had been having a big party; tracks crisscrossed the snow. I was, in fact, following very recent tracks of a large feline. I had yet to take my snowshoes off my pack, and so I comforted myself with the thought that the spikes could serve as a weapon, should I need one. I could feel a bonk coming on as I approached the sunny switchbacks. The snow was soft here and difficult to navigate. I leaned desperately on my poles. Seriously, I thought. Why do I do these things? It's always worth it on Mount Howard, though. At last I climbed to the tram building, closed for the season. In a few short months, thirty thousand people will arrive here via the gondola. But not today. Far below, the fog still choked the valley. Up here, it was a pleasant, warm day, though the lack of snow is a bit troubling. I should have brought a tent, I thought. It was that nice. Fog in the valley below. Good thing I carried these snowshoes for hours. Not sure what is going on with the braids. I sat on a rock and munched a snack before reluctantly heading back. The trek downhill was much faster, and nothing hurt. Even the treacherous patella decided to behave. Gaining the parking lot, I surprised a cigarette smoking man, who wanted to know where I had been. "How far is it?" he wanted to know. When I told him, he abandoned the idea. I get it, buddy, I really do. But the slog? Worth it, every time. Not much snow in those hills. A former boyfriend, a poet, the one who got away (but it was for the best, though I did not know it for several years), once read a poem he wrote by candlelight in a tipi (I am not making this up). In it, he referenced that blue light that is endemic to winter. Once he said it, I realized this was true. Although winter is not my favorite season, it does come with some incredible light. We skied in the growing dusk, our second of the season. The snow was a soft powder under my skis. It was perfect. I felt like I could go forever. Far out to the Zumwalt, I could see sun on the bleached hills, while we were encased in a world of thick, cold snow. Though summer is my first love, I can still fall for the spell that is winter in a northern town. I went for a hike up the West Fork Wallowa River. The snow was deep, the river shrouded in ice. I pushed past the only set of footprints on the trail to reach a popular summer junction. It will be a long six months before backpackers venture up here. Now we need a snowshoe brigade to pack it down for running. Or not. It's still good to slog, even though it takes twice as long. The wolves are out and about. We spotted their tracks on a road that is the main artery between the south and north in summer. Now, snow drifts it shut. Though Ruby was born in the desert, something in her ancestry tells her to love winter. She sleeps outside most nights. She is ecstatic over snow. That night, a supermoon rose over the snow-covered mountains, so large that it seemed you could touch it. We made the right decision, coming back, I thought. Even though the job situation is precarious, even though we are working ourselves into debt to build our house. Hello, blue light of winter.